Expert Opinion Testimony and Understanding Daubert's Gatekeeping Test В сложной финансовой ситуации приходит на помощь кредит наличными в Казахстане. Expert opinion testimony is an important aspect of complex civil litigation. Expert testimony assists in proving or disproving liability and damages. A credible and persuasive expert can make the difference in a case and retaining experts, generating expert opinions, and the manner in which expert opinions are presented should not be taken lightly. Not all expert opinion testimony is admissible. Courts are required to employ a gatekeeping function to ensure that expert opinion testimony is reliable before that testimony is admissible. This way unreliable expert testimony is not considered by the jury. Florida courts now apply what has been referred to as the Daubert test to determine the admissibility of ALL expert testimony. See Perez v. Bell South Telecommunications, Inc., 138 So.3d 492 (Fla. 3d DCA 2014). This test arose out of the United States Supreme Court’s decision in Daubert v. Merrell Dow Phamaceuticals, Inc., 509 U.S. 579 (1993) and has been the gatekeeping test applied to expert testimony in federal courts. 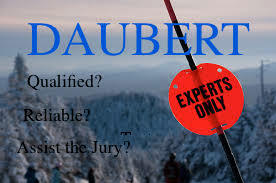 This Daubert test forms the basis of a court’s gatekeeping function regarding the admissibility of RELIABLE expert opinion testimony. How does a party offering expert opinion testimony satisfy its burden of establishing the reliability of the testimony? Parties need to know this because it is common for parties to file a (Daubert) motion attacking the reliability of another party’s expert testimony. Rink v. Cheminova, Inc., 400 F.3d 1286, 1291-92 (11th Cir. 2005) (quotation omitted). The first factor focuses on the qualifications of the expert. The expert needs to have some qualifications in order to render his/her expert opinion. Sometimes, however, parties hire experts with minimal qualifications. Federal courts have found that this goes to the expert’s credibility at trial and not the admissibility of the expert’s opinion. See Feliciano v. City of Miami Beach, 844 F.Supp.2d 1258 (S.D.Fla. 2012). This means that the other party can impeach the expert’s credibility at trial based on the expert’s minimal qualifications in order to create the appearance that the expert is not a credible or reliable witness. The second factor focuses on the reliability of the expert’s opinion. Just because a witness is qualified to render an opinion does NOT mean the opinion is reliable. A judge has a degree of leeway in determining the reliability of the opinion by focusing on certain nonexclusive factors such as “(1) whether the expert’s methodology can be tested; (2) whether the expert’s scientific technique has been subjected to peer review and publication; (3) whether the method has a known rate of error; (4) whether the technique is generally accepted by the scientific community.” Rink, 400 F.3d at 1292. This second factor is the crux of the Daubert test. See Fla. Stat. s. 90.702. To this point, Florida’s Third District Court of Appeal in implementing the Daubert test as its gatekeeping function stated: “‘a key question to be answered’ in any Daubert inquiry is whether the proposed testimony qualifies as ‘scientific knowledge’ as it is understood and applied in the field of science to aid the trier of fact with information that actually can be or has been tested within the scientific method.” Perez, 138 So.3d at 498. The third factor focuses on whether the expert testimony will assist the jury (trier of fact) in understanding an issue in the case. Thus, the expert testimony needs to be beyond the understanding of an average lay person and must not potentially confuse or mislead the jury. See U.S. v. Frazier, 387 F.3d 1244, 1262-63 (11th Cir. 2004). Also, the expert testimony must be more than what lawyers can argue in their closing arguments. Id. at 1263.